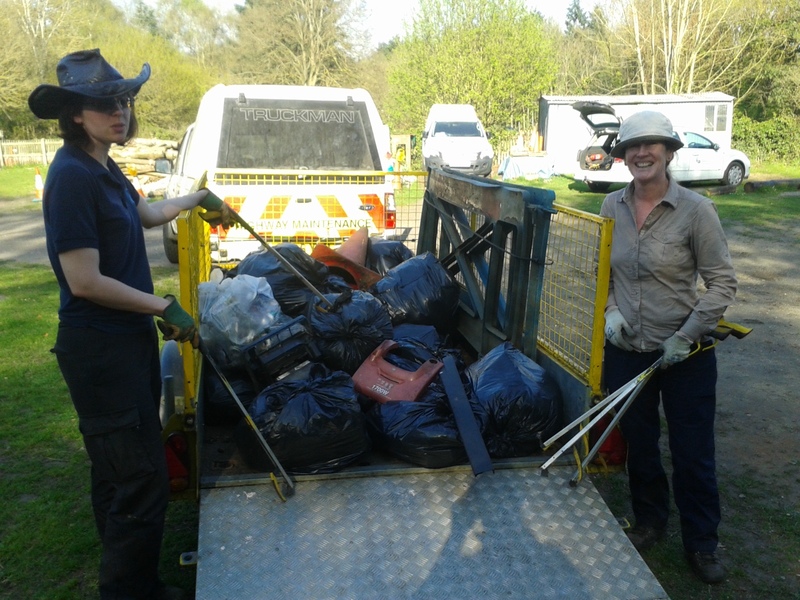 … the Tuesday Volunteers were out in force to litterpick the northern end of the Blackwater Valley Path. Sarah took one group from Sandhurst Memorial to Horseshoe Lake, I took another from Horseshoe Lake to the Tally Ho Pub and Paul took a couple of people up to Jouldings Farm. It was a lovely day, filled with sunshine and a light breeze and whilst we couldn’t match Stuart’s total for the Southern Path, we did manage to pick up 33 bags of rubbish, 1 vacuum cleaner, 1 cone and two plastic roadwork barriers! Sarah and I have also now seen more of the path than we’ve seen before as well, so all in all, a successful day. This entry was posted in Access, BV path, Events, Volunteers and tagged Blackwater Valley Path, litterpick, Tuesday Volunteers. Bookmark the permalink.